As an online marketer, you know how hard it is to come up with fresh content all the time. Keeping a steady stream of new material flowing on Facebook, Twitter, and other social media channels is a huge challenge. In fact, it can make you want to curl up in a corner and tell the world to go away. If you’re suffering from social media shyness—or even total fear—then you can breathe a sigh of relief. 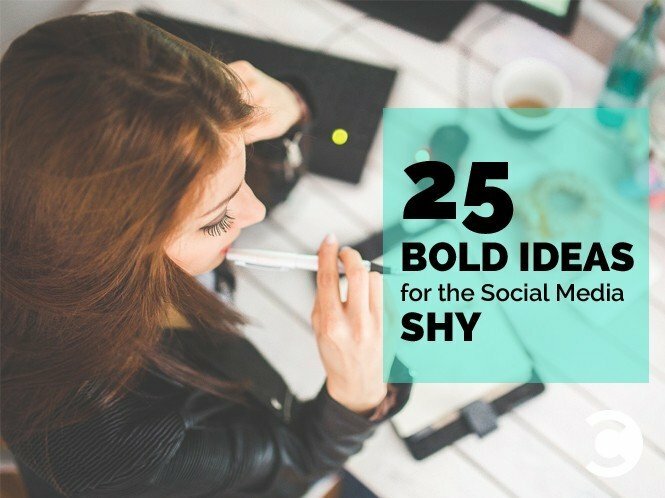 Here are 25 awesome ideas that will kick your social media presence into overdrive. Set up a weekly schedule for different types of posts. For instance, post a top tip on Tuesday, a link to an interesting article on Thursday, and a weekly news roundup on Friday. The routine will make it easier to generate content, and the regular updates will keep your followers coming back. A picture is worth a thousand words. Look for infographics that will inform and fascinate your followers, or create your own using a site such as Easel.ly. Everyone likes an opportunity to win something. Ask your followers to share their photos or stories, and then give prizes for the best ones. This creates a huge amount of engagement—and you get lots of content for free. If you come across useful tools on the web, share them with your readers—they’ll thank you. Productivity hacks, social media tools, and industry-specific calculators are all favorites—particularly if you find ones that are relevant to your niche. There’s no better way to create buy-in than to ask for feedback on your products. It shows people that you value their opinions, and it can also help you improve your products. Raising money for good causes is a great way of building a community. Set up a campaign on a site such as JustGive.org, and then publicize it on social media. Just don’t use this to promote your products, or you could end up with a backlash. This takes some work, but you can reap huge rewards. Produce an eBook with genuinely useful information, and then get people to sign up to download it. This is a wonderful way to build your contact list. On social media, people want to connect with real human beings, not just faceless brands. Share photos and videos from company events, your company’s sports teams, or even when you’re just having a good time. You don’t have to create all of your content yourself. Connect with bloggers on sites such as Tomoson and get them to review your products. Tweet out links to the reviews, and you’ll build lots of buzz. Polls are a great way to find out what people really think. Facebook and other social media platforms let you set up polls automatically, but you’ll often generate better engagement if you ask the question directly. If your product looks great, show it off. Post pictures of real people using your products, and make the images exciting. For instance, if you’re selling backpacks, show hikers wearing your gear in stunning locations. Monitor social media for questions that are relevant to your industry or products, and then answer them. This is a great way to start discussions and to build your reputation as an expert. Be the first to tell your followers about breaking news in your niche or industry. This is very easy to do if you use Talkwalker or another alerts system to monitor the web for new content with specific keywords. Put together a list of valuable tips that your followers can really use, and then tweet them out one at a time over a period of several weeks. It’s a great way of reminding people about your company on a regular basis. Show your followers how to do useful things with your products. People love tutorials—it’s something concrete they can use. A how-to guide doesn’t need to be long—try making a two-minute video and posting it on YouTube. Many companies avoid promotional product posts, but these are fine in moderation, especially if they contain genuinely useful information. Just make sure you strike a different tone than you otherwise would in sales copy— they should read like any other post from your company. Look for great material that will appeal to your readers, and then share it. This creates huge value for your followers, and it doesn’t take a lot of effort. Live online events are the ultimate way to connect with your audience. Pick a topic and run an online webinar, or start a Twitter chat using a unique hashtag. Pick a topic that’s relevant to your industry or niche, and then do a series of posts on it. Multi-part posts are great —you get several pieces of content out of a single idea, and people will keep coming back to read the next post in the series. Social media is full of lists, and for good reason. These are an excellent way to share useful information with your followers. Tag each link with the original author, and there’s a chance they’ll share or comment on your post. Social media loves quotes. Find quotes that are interesting and relevant for your audience, then post them. Don’t just stick to well-known quotes. Books, blog posts and webinars are all great sources. There’s nothing wrong with a little humor. Find a funny picture, and ask your followers to give it a caption. Just make sure to filter these before they’re posted to eliminate any objectionable entries. On social media, people trust your customers more than they trust you. That’s why customer guest posts are so powerful. Get customers to talk about an industry issue or how they solved a problem. There’s no need to make this a blatant product pitch. If you’re using social media to market to other businesses, then industry statistics are always a fascinating read. Look out for analyst reports you can repost, or even run an industry survey if you have the budget. If your audience is interested in your products, then chances are they’ll be interested in related products from other companies. Look for complementary items—not competitive ones—and make sure you try them out before you recommend them. If you haven’t already, start an editorial calendar and stick to it. Try to develop an orderly schedule so that people get a sense of what to expect and know when to come back for more. Try not to be too ambitious, or you might find yourself giving up altogether. If you’ve been hiding in the shadows, pick a few of these ideas and give them a shot. Jeff Foster is co-founder and CEO at Tomoson, the influencer marketplace. The platform allows bloggers and social media influencers to get paid for posting sponsored content, and lets businesses connect with targeted, niche audiences.